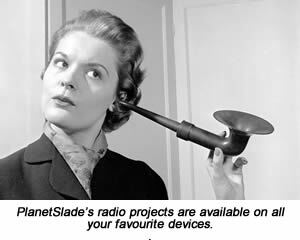 Every once in a while, I manage to persuade a radio station to turn one of PlanetSlade's ideas into a programme for its schedules. Clicking your chosen headline below will take you either to the programme's full online audio or to a BBC page telling you a little more about it. The Gallows Ballads Project (Oct 2016). Public hangings were a frequent spectacle in Victorian London, always attracting a rowdy mob. For the past five years, I've been collecting the printed ballad sheets sold as souvenirs at these hangings and inviting modern musicians to perform their gory songs afresh. 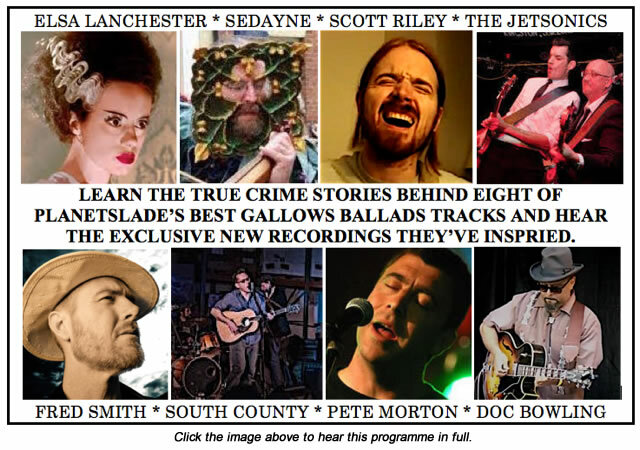 This programme tells eight of the true crime stories behind the ballads and plays the best new tracks they've inspired. Includes contributions from The Jetsonics, Pete Morton, Fred Smith and Elsa "Bride of Frankenstein" Lanchester. First broadcast: October 31, 2016. My role: Writer & presenter. 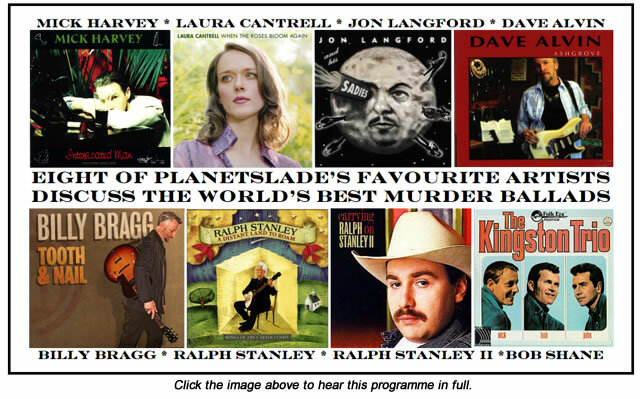 This programme canters through the stories behind five classic murder ballads from my 2016 book Unprepared To Die, playing some of these songs' best recordings as we go along. All this is interspersed with audio extracts from my interviews with the artists pictured here, giving their own insights and comments on the same five ballads. They bring a songwriter's eye to discussing these tales' endless fascination and reveal what it's like to inhabit a classic murder ballad as you record it yourself. First broadcast: January 28, 2016. I've done a handful of half hour documentaries for Radio 4 too, pitching my ideas via one of the UK's many independent radio production companies and then acting as a sort of glorified researcher/junior producer in getting the programme made. These shows all get a repeat on Radio 4 Extra from time to time, at which point they also reappear on the iPlayer for while. Clicking one of the links below will take you to the programme's BBC webpage but not - unless you're phenomenally lucky in your timing - to the full audio. Fortunately, I've also written up some of these topics as PlenetSlade essays, so you can still get the full story there. The capsule descriptions below are taken from the BBC's own programme summaries. The Grand Masquerade (July 2009). "Thirty years after the publication of Kit Williams' groundbreaking picture puzzle book Masquerade in 1979, John O'Farrell reflects on the mayhem that followed as millions of readers became caught up in the search for a jewel-encrusted hare, buried somewhere in the British countryside." First broadcast: July 11, 2009. The Dirty Dozens (Dec 2008). "Benjamin Zephaniah, known for his own high-octane performance poetry, tells the story of The Dozens, a 17th century language game and precursor to today's rap battles." First broadcast: December 23, 2008. King Size Papas (Sept 2007). "Julian Clary, best known for his own brand of sexual humour, celebrates the clever use of double entendre in 1920s and 30s blues songs." First broadcast: September 9, 2007. The Riot That Never Was (June 2005). "In 1926, 12 years before Orson Welles' infamous War of the Words broadcast, the fledgling BBC sparked its own national panic by broadcasting news of a murderous riot in central London, which turned out to be spoof created by Catholic priest Ronald Knox. Presenter Ray Snoddy finds out that then BBC managing director John Reith's reaction was a surprising one." First broadcast: June 16, 2005.